The creation of Martin Miller, publisher of the famous Miller’s Antique Price Guides, Martin Miller’s Gin embodies a passion for the best. It is made at the Langley Distillery in the Black Country using traditional methods and craftsmanship. ‘Angela’, a century old gem of a copper pot still, is the star of the show and, before distillation, the grain spirit and the botanicals are left to steep overnight in her generous expanse. Martin Miller’s prides itself on taking a smaller percentage of the spirit during the long slow process of distillation. But that’s not the only thing that’s special about this gin. The botanicals recipe is a taste feast with juniper and other common botanicals like coriander, angelica, orange peel and orris root but also the less often used cassia and cinnamon bark, ground nutmeg and liquorice and one other secret ingredient, believed to be cucumber. Like all gins Martin must be reduced with water to its bottling strength of 40% abv. 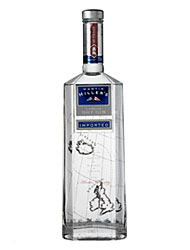 Miller’s Gin however takes this to an almost obsessive extreme transporting the elixir on a 3,000 mile round trip to Borganes in Iceland to be blended with what is considered to be the purest water on the planet. Filtered through lava formed millions of years ago, Icelandic glacial water imparts a freshness and smoothness to the taste of Martin Miller’s whilst also contributing greatly to its much vaunted silky texture. The end result of all this hard work is a gin that is gentle in the mouth with fragrant, slightly spicy aromas and a well balanced botanicals profile with strong hints of Parma violet and lavender. This unique taste profile makes Martin Miller’s the ideal gin for a host of new wave gin drinks with fresh, clean, natural flavours. Martin Miller’s Gin is produced by the Reformed Spirits Company, Plaza 535 King’s Rd. London SW10 0SZ, United Kingdom, Tel: 0207 352 8697. In the US it is distributed by Kindred Spirits. In the UK Martin Miller’s Gin is available at Oddbins, Selfridges, Majestic, Harvey Nichols, Fortnum & Mason and other good stockists. It’s also available on line at www.thedrinkshop.com and www.drinkon.com as well as top bars and hotels all over the world.